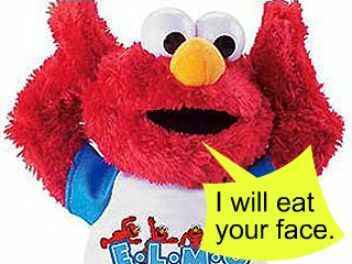 Elmo doesn’t really love you, in fact, he wants to kill you. Or so found out a Florida two-year old named James when his talking Elmo doll started making death threats. Elmo was behaving well enough, until one day the adorable toddler’s mother changed the batteries and the doll’s language took a Chuckiesque turn. It stated saying “Kill James”. How creeped out would you be, if the doll you had bought for your toddler started ordering his demise? After the family made a media stink about the incident last year, Fisher-Price, makers of the foul mouthed doll, promised to launch an investigation and replaced the offending, lovable, red mop-head. -To hear an audio recording of the doll saying “Kill James” click here.